Terroir: Re Manfredi’s Bianco Basilicata is a blend of Muller Thurgau and Traminer raised on hillside vineyards at an elevation of 1000 feet. The densely planted vines sit in well drained soils of volcanic soil at a south/ southeast exposure, soaking up the heat of the Mediterranean sun to achieve optimum ripeness. Vinification: Following a hand harvest, grapes are sorted and cold macerated for 48 hours followed by six months of aging in stainless steel vats. The wine is blended and bottled in the spring after a light filtration. 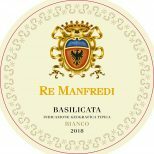 The 2018 Re Manfredi Bianco is clear gold in color with and aromatic bouquet. In the mouth the wine is complex and intense, displaying flowery notes and aromas of fresh fruit showing wonderful development of aromatic essences. This unique wine is full and round with a minerally, long finish. Volcanic soils and exceptional temperature ranges bring the aromatic profile of the grapes to the forefront, imprinting Re Manfredi Bianco with its inimitable, appealing style.